One of the main benefits brought by a Zodiaq quartz countertop is that its surface is easy to clean and maintain. With a regular cleaning routine, you can make your Zodiaq quartz look and feel like new for a longer period of time. The quartz used in the case of such countertops is combined with some high-quality polymers thus providing a stain, scratch, chemical, heat resistant and durable surface. However, you should not consider your Zodiaq countertop as being “proof" to various things – for instance, placing very sharp or hot items on this surface is likely to damage it. The beautiful and natural gloss and shine of a Zodiaq countertop can be maintained without having to polish its surface mainly because it is non-porous material that does not require any sealing or waxing. Also, if something happens to your countertop, you will be able to take full advantage of its 10 year limited warranty that comes along when you purchase this item. Basic care is required to keep your Zodiaq countertop clean – this means that you will have to use a paper towel or a damp cloth in order to clean its surface. 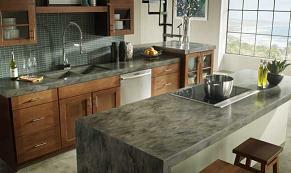 By cleaning your countertop on a regular basis, you will remove dirt and dust. By using some quality non-abrasive cleaners, you can make sure that your Zodiaq countertop stays free from bacteria and germs. Keep in mind that even if this countertop has a stain resistant surface, you have to remove any liquid spills immediately. For instance, leaving standing water on this surface is a bad idea too as it can slowly change the color and look of your quartz countertop. Also, you must avoid using cleaners that have bleach in their formula as they can discolor your countertop. Go for a recommended cleaner such as Formula 409 Glass and Surface or 3M Scotch-Brite. Once you end up with some really hard spills like food, gum or grease, you should use a quality plastic putty knife and have these spills gently removed from your countertop. Next, you will have to clean the surface and wipe it off by using some of the cleaning methods that have already been listed above. For permanent markers, go for a quality cleaning product such as Goo-Gone and rub this cleaner right into the stain. However, you will have to use all the directions carefully – make sure you don’t leave the cleaner on the countertop for a longer period of time than required. Also, you must make sure that you avoid chemicals near your countertop – avoid furniture strippers, nail polish removers, oil soaps, paint removers and so on as they can damage the surface of your Zodiaq countertop.